Layered athletic top featuring a front zip. 4 recolorable areas, black, trendy poppy red and Barbie pink color variations included. Sport layered top for females. 2 recolorable areas, 4 color variations in the same pack, custom cas and launcher thumbnails. Sport fit shorts for females. 3 recolorable areas, 3 color variations in the same pack, custom cas and launcher thumbnails. Athletic bra, 3 recolorable areas, 4 color variations included in the same pack, custom cas and launcher thumbnails. Sport fitted capri. 4 recolorable areas, 4 variations in the same pack, custom cas and launcher thumbnails. 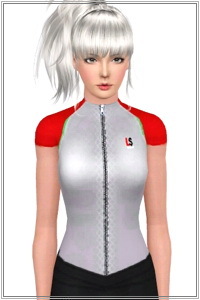 Zip front sport top for your athletic Sims 3 females wardrobe. 3 recolorable areas, 3 color variations, custom thumbnails.